The Toyota Avensis Touring Sports Wagon is well equipped, spacious and sensibly-priced. When the bulk of your car sales are to businessmen and women who spend hours behind the wheel you have to make sure there are plenty of onboard creature comforts. 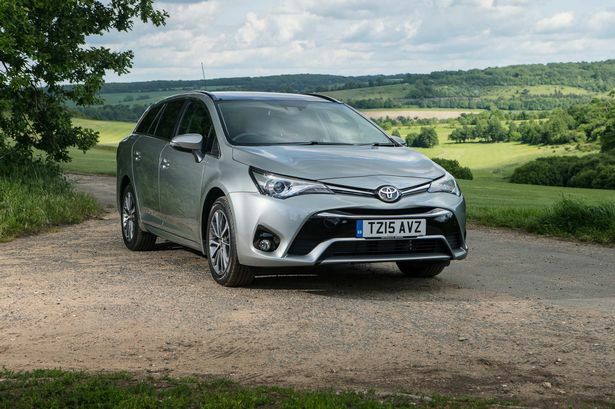 So with close to 90 per cent of Toyota Avensis sales going to the fleet market the company has gone all out to ensure the third generation of this popular model is easy to live with. In fact there is a special “Business Edition” available in both the new saloon and the new estate – or Touring Sports Wagon as Toyota calls it – geared specifically for today’s on the go executives. The Business Edition, the model tested here, comes in around halfway up the price list for this, the third generation Avensis, and adds features like Toyota’s Touch 2 with Go touchscreen multimedia and navigation system, a comprehensive audio package with DAB and a very useful – the Touring is a very long car – reversing camera with colour display. You also get 17-inch alloy wheels, automatic air conditioning, Lane Departure Warning to let you know if you have drifted over the white line and Automatic High Beam so you don’t have to keep switching your main beam on and off as cars approach – the car does it for you. Step up to Business Edition Plus and you get additional features including leather upholstery with Alcantara inserts, heated and electrically adjustable seats, 18-inch alloys and LED headlights. But whether you are a business buyer or a private buyer the new Avensis has far more appeal thanks to its more dynamic appearance and its more spacious interior. The overall length has been increased by 40mm making this a very comfortable five-seater with plenty of luggage room, particularly in the Touring model. There’s some 543 litres of boot space with the rear seat backs up and a whopping 1,609 with them down. That means a car that has plenty of space for all your holiday luggage – even if you are going on a cruise. Under the bonnet of my test car was a 1.6-litre diesel engine, perhaps surprisingly supplied by BMW. Emissions are low to appeal to the business community and while the power is reasonable you have to work the gearbox to get the best out of it. The steering is positive and pin sharp and judging by the lower noise levels in the cabin Toyota has done a lot of work on soundproofing. The Avensis is refined and comfortable, however, and well put together. There is a feeling of solidity about the car and the doors close with the gentlest of touches. All new Avensis models come with hill start assist so you don’t roll backwards on inclines, a speed limiter so you can avoid getting points on your licence, cruise control and drag and flick for the multimedia system so you can use smartphone-style gestures. There is an electronic rather than manual handbrake, and while you have to release it before driving off it’s applied automatically when you switch the engine off. Well equipped, spacious and sensibly priced the new Avensis Touring Business Edition is set to do well in the world of work. Mechanical: 1,588cc, 110bhp, 4-cyl diesel engine driving front wheels via 6spd manual gearbox.